Russell Erxleben was an amazing kicker and punter in college for the University of Texas kicking an NCAA record 67 yard field goal in 1977. 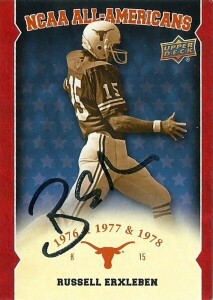 He’d be named All American 1976-1978 and also set a Texas single season record, averaging 46.6 yards a punt. After graduating from UT, the New Orleans Saints made Russell their #1 pick in 1979 where he’d play double duty again as a punter and kicker. Oddly the team utilized him sparingly as a kicker over his career but he averaged a bit over 40 yards a punt in his 5 seasons with the Saints punting 279 times, including a club record 89 in 1980. In 1982 Erxleben had a career high 43.0 yard average on 46 punts. He’d be cut in 1983, and play as a scab in 1987 on the Lions for one contest, but subsequently retire after the season. Unfortunately Russell’s name has never been able to shake his lofty draft status, since he was the second highest drafted kicker in NFL history. Erxleben was also convicted of securities fraud in 1999, and but was released in 2005. He currently is retired and living near Dripping Springs, Texas, and enjoys watching his son follow in his footsteps as a kicking specialist with- Texas Tech. Somebody was cutting corners on these cards with that weak blur in the background of Erxleben’s set card. Didn’t you guys learn how to make proper masks in Photoshop? As far as autographs go, Russell has a fairly pedestrian one, as it lacks the boldness of an autograph but belies the subtlety of a signature. I rubbed the film significantly on the surface of the card so that it could take the autograph better, and it appears for the most part that it worked as there is only a little ink loss from the bubbling. 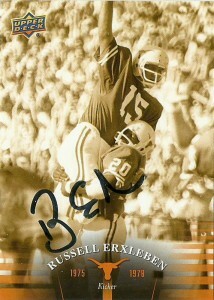 Erxleben makes the first TTM success from the UT Upper Deck 2011 set, signing these 2 cards in 10 days. I look forward to many more in the future and this is a great way to get fans interested and aligned with particular college interests.